OK, late to the game as usual, but I love boxes. Especially glass boxes. 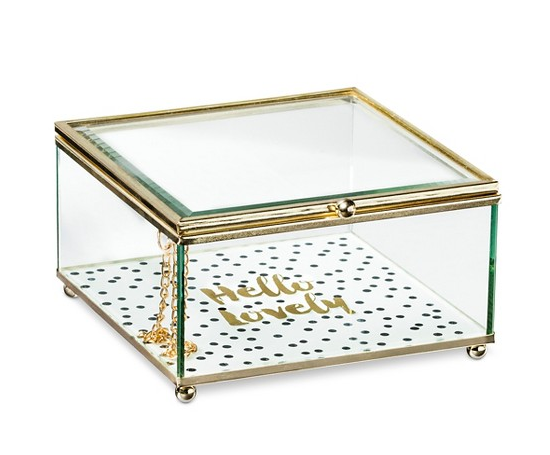 Especially decorative glass boxes with delightfully cute messages. How many do I have? None. How many do I need? Well...none EXCEPT THIS BEAUTY from the one and only Target! Possibly one of the things I miss most about living in Richmond (and the US in general) is Target. That great big bullseye holds the key to my heart and can cheer my up just by setting inside, though I tried it on Black Friday once and am still traumatised. Any friends coming over soon, consider this your hostess-gift hint. In return, I'll present you with Belgian beer and endless puppy cuddles.